It’s been a month and a half since my daughter graduated from USC!! Wow, it’s still sinking in that I’m the mom of a college graduate. As I type this, I just got off the phone with her, on the heels of her first business trip. It’d be unprofessional (and perhaps contradictory to some of the words below) to brag like I REALLY want about her dream job that she landed a week after graduation, so this overly zealous mom will try very hard to focus this post on a significant event celebrating her and her peers’ accomplishments. Graduation weekend still replays in my mind and always will. Dare I say it’s an accomplishment, in an itty-bitty way, for parents who raised these accomplished graduates too. I still spot tweets about commencement addresses that continue to resonate so I don’t think I’m too tardy in posting about this now. Prep for graduation day!!! . 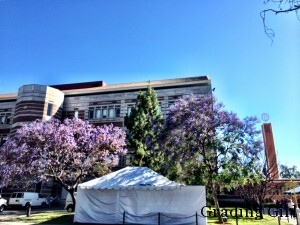 . . Breathtaking campus – with or without the tents! 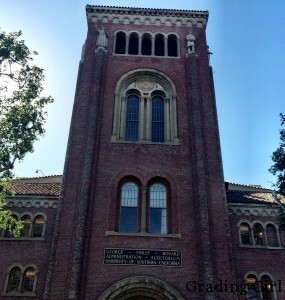 One of the amazing experiences was attending the USC 2014 Baccalaureate Ceremony, a non-denominational, inter-faith celebration, on Thursday, May 15th, evening before graduation. While we had the pleasure of listening to three commencement speeches before the weekend was over, Rainn Wilson’s keynote speech of the evening, “The New American Dream: Life, Liberty, and the Pursuit of Service” is the one that resonates most with me. Listening to his speech was particularly poignant for my family as we’ve watched “The Office” religiously since Season 1; Dwight is one of my daughter’s favorite T.V. characters – she still has her Dwight bobble-head!! Sitting in the front row only added to the blessing of being able to attend! HERE’s the speech in its entirety. It is worth your eighteen minutes! The following key points are as I digest them. I really did want to take notes, as Rainn jokingly tells the audience to do. But, articulating the major points of this speech now, after letting thoughts ruminate, is truly a cathartic experience in itself. So I thank you, Mr. Wilson!! You’ve helped my family through day-to-day stress years ago by providing truly fun entertainment on television; and now, you are providing thought-provoking philosophies to help us grow spiritually. To open the presentation, Rainn Wilson candidly revealed that he came very close to canceling because he himself has been going through a rough month in his own life. This instantly gave him powerful sincerity in the words he shares, believes and strives to achieve himself. He is attempting to achieve these laws, admittedly with difficulty, within his own world. Powerful!! Speaking of powerful, he referred to prayer as the most “powerful force in the universe” and I’ve since used that phrase aloud myself in a number of conversations with a couple folks who are also going through a rough time. I believe this is true. Rainn outlines the majority of the speech with laws for happiness but quickly declares how much he actually despises the word, happiness. It seems to connote a fleeting choice that is outside of ourselves. He compares happiness with eating cotton candy (which I’ve been known to inhale, so I related well to the fleeting sensation). Like cotton candy, happiness gives us a high when we digest it but we almost immediately crash, wanting more fistfuls to keep us satisfied. Joy, contentment, serenity are all words he likes better that connote more permanence. These words more specifically refer to perspectives and beliefs within us. Bottom line, this man knows a thing or two more than just paper. His words are wise and real. 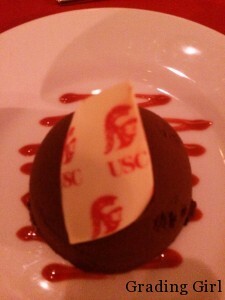 Trojan Cupcakes at the evening’s dinner! 1. Happiness is not an if/then proposition. If/then equations never meet our ultimate needs or fulfill our true standards. Happiness is cotton candy – it’s sticky and dissatisfying. Real happiness is found inside of ourselves, a choice that we make from within. If/then decisions such as these only lead us wanting more: (If I make _____ amount of $$, then I will be happy; If I become a ________, then I will be happy; If I marry _______, then I will be happy.). Happiness is not outside of ourselves or even something to be pursued, Rainn goes on to say. Happiness is not defined by any thing or any person or any entity; it is a state-of-mind. I believe this is true. Choosing to view all life experiences as positive is a choice that leads to contentment, not necessarily the life experiences themselves (which eventually end) being the contentment. 2. “Desirelessness” can set us free. Rainn goes on sharing that desire leads to dissatisfaction whereas non-attachment leads to joy. Physical happiness is limited; spiritual happiness is eternal. According to the actor’s testimonials, spiritual beings have more human experience. Those who are spiritually engaged are far happier than those who are not because they are searching from the inside out rather than the outside in. In his explanation, Rain explains that we constantly long for permanence in a world that is impermanent in every way – we ourselves are not permanent pieces of this earth. Nothing remains the same. Suffering, therefore, lies within any outside attachment. When we detach from whatever is outside of us, we are free to be content. We are so much a part of this outside world and are constantly bombarded with commercialism, as Rainn refers to, with societal pressures, with getting ahead and with wanting more. Detachment from these things does not mean being uncaring, lazy or laissez-fair; it simply means not letting these things we can’t hold forever make us forget what we can hold on to – our beliefs and values. 3. Live in the spirit: Concentrate on the divine, spiritual part of who you are and you will find true satisfaction, according to the man previuosly known as Dwight. Live in your soul. To me, this means search for what inspires you, search for what makes you want to create, search for what you love – and you’ll never “work” a day in your life. I don’t! 4. Have an attitude of gratitude: For this law, Rainn referred to his digital media company, SoulPancake ,and an experiment they conducted titled “The Science of Happiness.” I’ve been following his channel for quite some time. There are numerous videos on this channel that are very useful supplementary material to share – – -hits-you-in-the-heart messages. Rainn goes on to say that complaint is easy and, similarly, cynicism is easy to fall back on. I personally know a couple souls who I believe truly feel more comfortable living within cynicism. They don’t take gratitude and good fortune with nearly as much grace as they deserve to. As Rainn stated, gratitude takes work – this I know firsthand but I also know firsthand that gratitude has the best payoff! I am genuinely grateful for all I’ve experienced, given and received – and I am trying very hard to openly express that gratitude much more often to more people. Rainn Wilson is correct: Think of something you are grateful for, share it and your heart will soar. 5. Be here now! Live in the moment . . . do not anticipate troubles, do not live in the past, do not be anxious over the future, do not live in your head or on your phone. We need to live in the moment!! I can’t tell you how depressing that too-familiar downward posture looks when I see a person peeled to his or her phone. He or she misses so much! Everything we need is right here, right now. The past and future are illusions . . one is a dream, the other hasn’t happened yet. I love this one!! It prompts us not to worry about that which we have no control. 6. The greatest meaning you will find in life, you will find in service to others. Ironically, the more we search for ourselves, the less likely we are to find ourselves. The more we search for God and our fellow man, on the other hand, the more we find ourselves. Self-esteem, life satisfaction, sense of community is brought to light by service to others! Show kindness, sacrifice time & energy – this is what life IS. The best way to combat a bad mood or even depression is to serve others – whether that means a full-out volunteer position at your local animal shelter or simply baking banana bread for your super wonderful, next door neighbor. “In this me-me-me culture,” Rainn Wilson warns, “focus on yourself and you will find only misery, depression, emptiness. Focus on helping others and you will find joy, contentment, gratitude and buckets and buckets of eudaimonia”—a reference to the ancient Greek concept of happiness, which, Wilson explained literally means “human flourishing.” Maybe this is why my job career lifestyle as a teacher does not feel like work. We service some very special clients all day long – the students! With every speech (and every piece of writing), we take what we can and want to out of it, what works and resonates with us. Each of the six “Laws of Contentment” speaks to me. And unlike the character he played on T.V., Rainn Wilson didn’t need to pound on the podium or wave his arms around to get his point across. Thank you, Rainn, for sharing your beliefs, your philosophies, your views, your care. I am genuinely grateful! 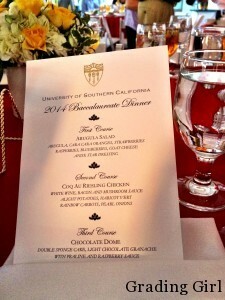 Post-ceremony Dinner – delicious, elegant, joyous!